The story of the Stoneforge Mystic is a story about patience as a virtue. Released in 2010’s Worldwake expansion, she was recognised by many for her card advantage and tutoring, but in the environment she was born into, this wasn’t very exciting. Luis Scott Vargas of Channel Fireball- noted for his set reviews (and dreadful punnery)- spoke with the voice of many when he said that she was “unlikely to make a splash in Standard.” And he was right… for a little while. 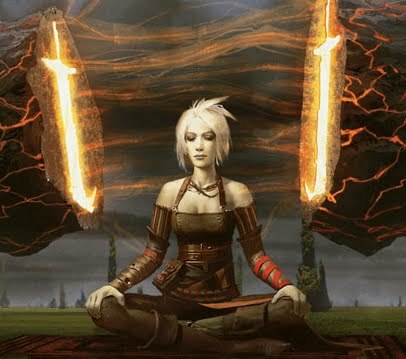 Then came word that the next block was a return to Mirrodin, and with the artifact pool about to get a huge boost, canny minds thought back to this belle-of-the-ball-to-be still waiting for her chance in the spotlight. The actual release of Scars of Mirrodin brought even more around, and slowly her price started to move. 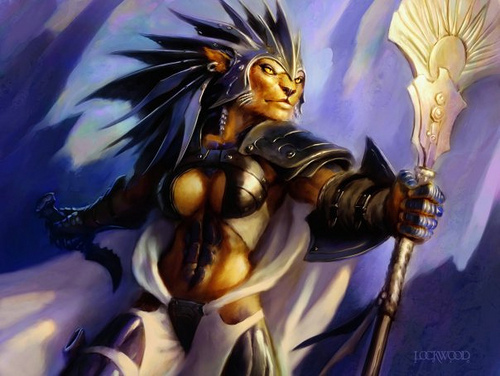 According to the Black Lotus Project, which tracks price trending for Magic cards, 19 October 2010 was the day that Stoneforge Mystic became a débutante. Long languishing as an inexpensive rare, she crested $5 in value for the first time after some nine months in waiting and slowly began climbing as more people gave her a look. Then things changed overnight- as they can- with a Pro Tour. The Caw-Go deck, which Brian Kiber had played to no small notice in Worlds the previous December had been given a gift in Mirrodin Besieged: the Sword of Feast and Famine. With the Stoneforge Mystic perfectly positioned to take advantage of this new mythic equipment, Ben Stark’s upgraded “CawBlade” list took him top honours at Pro Tour Paris in mid-February. Over the course of that weekend, whispers and mentions leaked out that saw the Mystic crest $8 in value. By two weeks after the event- with the full decklists spoiled- she was already on her way to $12 and climbing fast. She would soon reach her zenith at over $18 and become one of the Standard environment’s most sought-after cards. Not bad for a wee slip of a thing from nomadic paths of the Kor, no? And while the story of the Stoneforge Mystic is not the story of War of Attrition, you could not tell the story of War of Attrition without it. According to Wizards Director of R&D Aaron Forsythe, Stoneforge Mystic was $4 when the deck was shipped off to the printers. It is the Mystic’s rise to prominence which has given this latest round of Event Decks the commanding attention denied the first two. 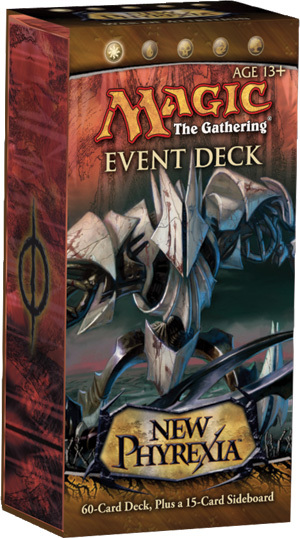 First introduced with the Mirrodin Besieged expansion, this is the second launch of the Event Decks product. Some things haven’t changed- you still get a 60-card deck with seven rares, an attractive storage box, and a spindown life counter. Today we’ll be looking at what has changed, and perhaps the most interesting thing that has isn’t even inside the box. One of the things that we took issue with when we reviewed the initial set of Event Decks was their positioning. This is no small challenge. How do you design a deck under strict rarity distribution limits that can still put up a good fight on the field of competitive play? Clearly learning from the lessons of their previous two decks, Wizards has answered that with a single word: speed. Speed is the one element that can cover up the greatest amount of weakness. Card advantage is nice, but when your deck is filled with suboptimal cards what good will another one avail you? Trying to compete in the midgame or lategame with a control element is risky- while you’ve spend your time deploying your cards, so has your opponent- and that can be lethal if the decks are too mismatched. However, even a deck filled with commons can have its day if it’s quick enough, and strikes at the heart of the enemy while they’re still setting up. Additionally, speed gives you the extra advantage of capitalising on your own enemy’s bad beginnings. The longer a game goes on, the more a deck will stabilise after a shaky start or questionable keep. They’ll eventually draw that land (or, in the case of mana flood, that non-land). They’ll find that removal or sweeper. But if you’re quick enough, speed kills. When designing a product to be released months down the road against an uncertain meta, it’s as sturdy enough a rock to put your back up against. Upon first blush, even War of Attrition’s impressively front-loaded mana curve is a bit misleading. Fast, right? Well, the good news is, the deck’s even faster. If you don’t mind throwing a little life into the bargain, that curve will instead read 6 — 15 — 2. In the one-slot, we begin with a playset of Elite Vanguards. A simple 2/1 beater, these trade poorly but can give you a very quick start, especially against creature-light opponents. Like many cards in such a top-heavy strategy, you’ll be less enthused to draw them later in the game, but by the same token if the game’s gone on that long, you’re already at disadvantage. There is also a pair of Kor Duelists included. Although rather weak on their own, the deck packs in enough power-pumping Equipment to make the double strike of the Duelist a very appetising prospect. Moving on to our two-drops, we first have a playset of Leonin Skyhunters. A 2/2 flyer, these compare interesting to the Armored Warhorse, a 2/3 non-flyer in the upcoming Magic 2012 Core Set. With identical cost and rarity, it gives you an approximate idea of the valuation of evasion by R&D. Aside from a singleton Skinwing, which we’ll touch on later- these are the entirety of your air force. Use them wisely, as they’ll claim games on their own if you can get thim equipped quickly enough. A playset of Leonin Relic-Warders offer you the opportunity for a two-for-one against your opponent, as well as giving you answers to various artifacts and enchantments you might encounter on the field of battle. The two Stoneforge Mystics give you the ability to tutor whatever Equipment is best suited to your needs at the moment, and with four of them costing more than two mana, her other option can save you a fair amount of mana as well as accelerate your pace. If that wasn’t enough Equipment synergy, there’s also a Puresteel Paladin. The only way you have to draw extra cards, this can be a much-needed refilling of the tank over time, but its his second ability that’s in some ways the more exciting. By reducing your equip costs to zero (once his metalcraft is turned on), this prevents you from wasting turns fidding around with your gear. Although the generally cheap cost of the Equipment in War of Attrition makes the possibility less likely, the prospect of using two turns to play and then equip is never an appealing one. The Paladin lets you bypass that, and contributes to the overall speed and efficiency of the deck in doing so. Somewhere in analysis-limbo between the two- and three-drops is your playset of Porcelain Legionnaires. Brutally strong cards, you’ll want to pay these in life wherever possible so long as it gives you a speed advantage (as it often will). The first strike the Legionnaires bring is especially strong when equipped, and from our experiences testing Life for Death, they’re not something most anyone will be happy to see land on turn 2. Finally, a pair of rares round out our creature selection with a Mirran Crusader and Kemba, Kha Regent. The Crusader is a straightforward beater, a 2/2 double-striker with protection from Black and Green. Kemba’s an intriguing choice. Her 2/4 body will prove resilient (she’s un-Boltable), and she can provide virtual card advantage once you land some Equipment on her. This won’t be a strategy of first resort- the last thing you’ll want to do is wait a bunch of turns on purpose just so you can horde in with Cat tokens- but its more of a safety net, a way to keep pressure on if the board’s stalled out and threaten in with one large alpha strike. Thus far we’ve covered almost 2/3 of the deck, but as you’ll see we’re far from done with creatures. Every card but one in War of Attrition falls into one of two camps- removal or Equipment. The maindeck removal is spartan- a playset of Journeys to Nowhere. What you get rid of will depend on what you’re facing, but with so little of it at your disposal you’ll want to be sure its put to good use. Like all weenie/swarm strategies, you could do worse than to remove and early defender if it means getting in for more damage. The longer the game is allowed to go on, typically the less likely you’re going to be to win it. Of course, your mileage may vary. Of the seven pieces of gear, all but two of them are living weapons, which means the deck is even more stuffed with creatures than it initially appears. A playset of Flayer Husks aren’t the most exciting card around, but they’re the cheapest of their type available. This lets you get them out quickly, get a few points of early damage in, then move them onto a body that will put them to better use, such as your Kor Duelists, Leonin Skyhunters, or Porcelain Legionnaires. 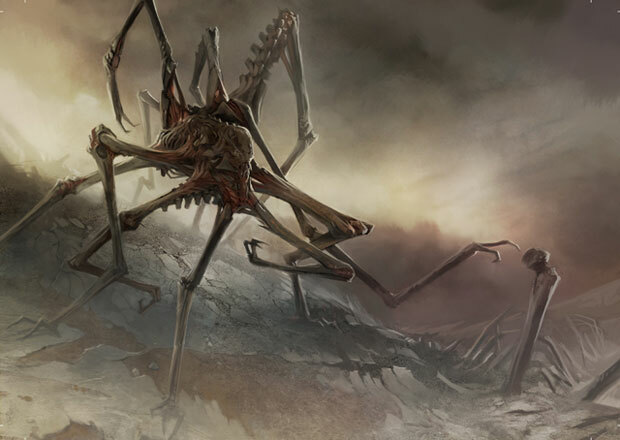 There’s also a Sickleslicer (essentially a double-Flayer), a Skinwing for evasion and a Bonehoard as well. The latter is a finishing card- by the time you’re going to be able to play it, you’ll very likely have a few bodies in the graveyard to make it worth your while (and if you don’t, bully for you). Again the Puresteel Paladin and Stoneforge Mystic will happily reduce the somewhat unpalatable mana costs on some of these, so you’ll often be getting them at a discounted rate. From there we have another cheapie- a Darksteel Axe– and one more premium piece of gear in the Sword of Vengeance. Another ‘closer’ card, sticking this on one of your first strikers or flyers will put your opponent on a clock. Lastly, there’s a singleton Apostle’s Blessing, which can either prevent the loss of one of your creatures due to removal or give one of them a way past your opponent’s defenses to deliver a killing blow. It’s not great here, but its inexpensive cost and versatility mean you’ll seldom be without some use for it. Now for those keeping score at home, we’re up to thirty creatures in the deck between the conventional ones and your living weapons. Still not quite enough? Well, if you happen to have a little extra mana laying about later in the game, you’ll find a good use for it in the pair of Dread Statuaries included alongside all the Plains. War of Attrition also totes along a full fifteen-card sideboard filled with a few more goodies. Up against an artifact-heavy deck? The playset of Revoke Existences will come in handy. Facing down heavy Red? There are four Kor Firewalkers happy to tear into some Goblins. Need a little more removal against a creature-strong opponent? 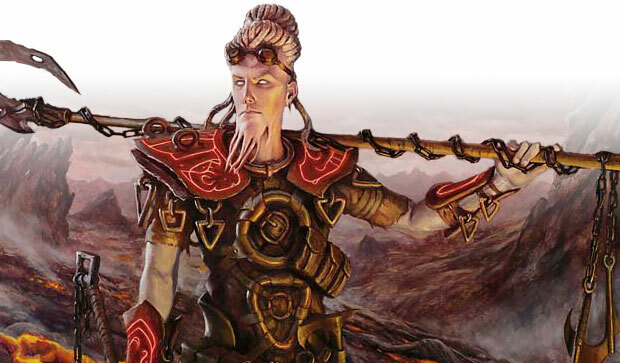 Try two Arrests and a trio of Celestial Purges– the latter of which goes after permanents, not just creatures. You also get a second Apostle’s Blessing (worth considering against decks heavily favouring a single colour) and a throw-in Kor Duelist. If there’s a weakness with the product design, though, it is here. For advanced players it may not be anything unusual, but sideboarding is one of the great challenges for the junior player. It’s not always obvious what needs to go in or- even worse what should come out. Cards like Celestial Purge and Kor Firewalker rather steer themselves, but others might not be so obvious. If this is the gateway to competitive play, we’d like to see more of a guide included on how to navigate this critical aspect. In our next piece, we’ll be analysing the other Event Deck, Rot from Within, before pitting both decks against one another to see how they hold up. See you then! ← MBtB: The Precon Buyer’s Guide Concludes! Nice deck, at least for a casual environment. A bit puzzled about the singletons Apostle’s blessing and Skinwing, wouldn’t be better to change them for the third Kor duelist and other living weapon like another Sickleslicer? The cards i’m most excited about are the Porcelain legionnaires. They’re pretty good by themselves, but equipped with a darksteel axe or sword of vengeance they can win the match by themselves. Needless to say, I’m super hyped for this deck and can’t wait to see it in action. Again, as always, i’m excited to see this deck in action. This on in particular seems as though it might really be competitive. It’s amazing that they put in TWO Stoneforge Mystics. I wondered if it would drive the price down on them, but I think it will actually drive the price of the deck up. I plan on mashing two of these together and see what my ultimate product turns out like. Perhaps I’ll take it to a little tourney and see how a modified precon can do!